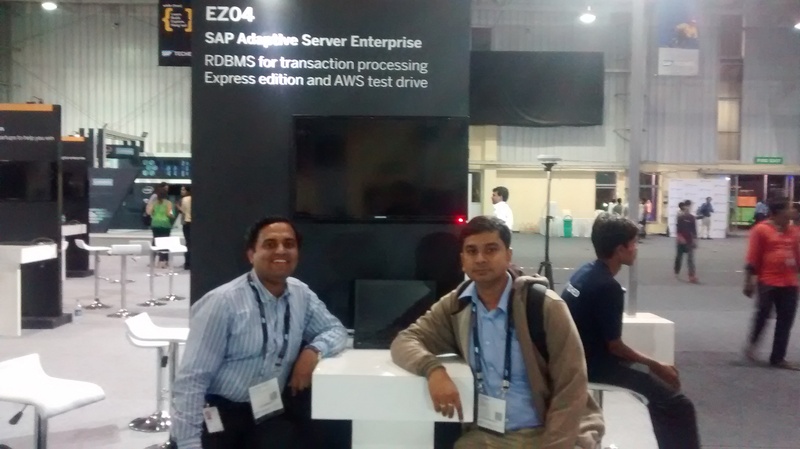 This was my first experience as an Attendee in a technical event of such stature and it was very exciting to see the amount of enthusiasm shown by SAP Consultants and partners at TechEd BLR-2016. TechEd began with the welcome note by Dilip Khandelwal followed by the SAP Executive Keynote by Bernd Leukert where he introduced HANA Express Edition that can run on laptops and VMs up to 32G of memory use. Some of the other key topics which Bernd covered were related to IoT, Artificial Intelligence which gives us a directions towards the road-map down the line. Post this session, I attend a hand-on workshop on HANA operations where they showcased current native tool offerings for HANA database administration like Cockpit, DB Control Center and HANA Studio along with some lab work. The final technical event for the day was DemoJam, the developer’s competition where folks from SAP and partners showcased some very smart solutions mostly built around SAP HANA platform. Our Day-1 at TechEd ended with a colorful musical night show by Neeraj Shreedhar (‘Bombay Vikins’ fame) which everyone thoroughly enjoyed. Day-2 began with Road Map session on SAP Replication Server which I and Shashi attended together where they highlighted its key capabilities and planned innovations along with future direction for SAP Replication Server, main focus was on Business Continuity offerings like Always-on (HADR) further integration with SAP HANA. After this I attended a lecture session on how SAP HANA and SAP IQ, along with Hadoop/Vora, form the core components of a large scale telco analytics solution. This was presented by a SAP colleague Naval Deshbandhu. My next session was Roadmap for S/4HANA. A point to be noted that S/4HANA and IoT attracted huge attendance in each and every sessions throughout the course of 3 days. I also attended a lecture session on How to Plan and Execute a Migration to SAP HANA which was quite useful in the sense that they showcased latest improvements in SAP HANA, various tools and methodology to perform on premise migration of SAP Business Suite to SAP HANA and basically what should we take into consideration when migrating to SAP HANA from project planning aspects. Day-3 began with an interesting lecture on IoT Solution Architecture and Best Practices from SAP which was again an exciting session with respect to future technology innovations and SAP’s focus on IoT. I attended a workshop session on HANA Advance Operations which unluckily didn’t go well (incomplete) due to some technical issues with their lab environment. Later I attended a very interesting session on SAP HANA Accelerator for ASE presented by Labs colleague Amit Pathak where he gave technical details on SAP ASE acceleration options made available with ASE 16 sp02 which provides access to HANA’s in-memory columnar performance for ASE queries and stored procedures. Finally, the last session I attended in TechEd was about high level overview of SAP HANA virtualization and multi-tenancy options. In between my pre-scheduled lectures and events, I also visited couple of booths on IoT, S/4HANA and HANA Cloud Platform which was quite informative. During the course of these three eventful days, I got chance to meet lot of old colleagues, folks working in other units like AGS and Managed Cloud Delivery to name a few. I come from Sybase background and it was really nice attending all the related lectures and road map sessions. Would definitely like to attend Tech Ed in future as well ! !